Why do dogs become fear aggressive? The root of most aggressive behavior is fear. Combine fear with a situation where a dog has not been raised and trained humanely and the result is often a disastrous cocktail of fear aggression. This is frequently made even worse by owners and trainers who employ punishment-based techniques on the fear aggressive dog. Another common root cause of fear aggression is a lack of appropriate socialization during the dog's development. If a dog has not received adequate socialization, she will find it hard to cope with new things she encounters in her environment such as other dogs, animals or people. How do I know if my dog is fear aggressive? Dogs that are fear aggressive will often adopt body postures that signal fear while retreating, such as cowering, lip licking and baring teeth. If your dog is cornered or has nowhere to run, she might growl, lunge, snap or bite in an attempt to get the threat to move away. Dogs with fear aggression might retreat if someone approaches them but can then turn and nip at the person as they walk away. 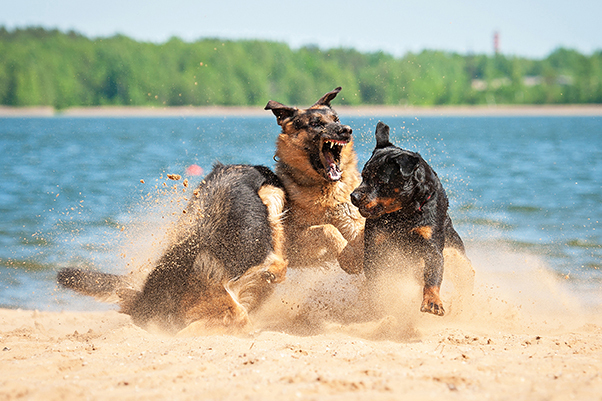 Fearful dogs often inflict shallow, rapid bites designed to remove the threat rather than doing serious physical harm. Can I cure my fear aggressive dog? It is important to note that while the prognosis is good for many fear aggressive dogs there is no 'cure' for aggression. Behavior can never be guaranteed in people or in animals because there are too many outside factors influencing behavior, mood and emotion. Just like people, dogs can simply have a bad day! While there is no 'cure' for fear aggression, there are many positive things you can do to help manage the problem and get your dog to a place where she can exist in harmony within an environment which she previously found scary. Contact a qualified humane positive trainer to work with you and your dog using humane desensitization techniques. These will give your dog more confidence to cope with her fear. Find what triggers a reaction from your dog. When you have identified the trigger, put your dog in the position where she does not have to experience the trigger. Less rehearsal of aggressive behavior means there is more of a chance the behavior begins to decline. Try and make your environment as predictable as possible. Fear aggressive dogs do not like surprises so keep your dog’s surroundings as calm as possible until she is more confident and able to deal with novelty. Get your dog’s leash and take her outside so she can see the guest standing there. Have your guest stand with a plastic bag that you have previously placed by the front door. The bag should contain your dog’s favorite chew, toy or bone. Come back inside your home and take your dog through some action cues like sit or down as your guest comes in. Have your guest take the chew, toy or treat out and place it on the floor a safe distance away from your dog who must still be on leash if there is any likelihood she will aggress. Let your dog chew on the treat or toy. Chat with your guest while your dog is chewing and when it is appropriate take your dog to a safe zone for some quiet time. The safe zone should be in a separate room behind a baby gate or in the dog’s crate with the door closed. Practice this ritual with friends and neighbors that are willing to help and your dog will soon associate the bell ringing and a guest entering with good things. Once your dog is no longer fearful you can start having guests come into the home without having to take your dog outside. A guest can still enter with the bag in her hand but this will make the greeting ritual less time consuming. Tell your guests to give your dog space and limited attention. You can make up any ritual as long as it is something your dog enjoys. The secret to success with this one is to keep your dog thinking and working, which will keep her below her stress threshold, and give her space, while also keeping guests safe.